View from the balcony…. 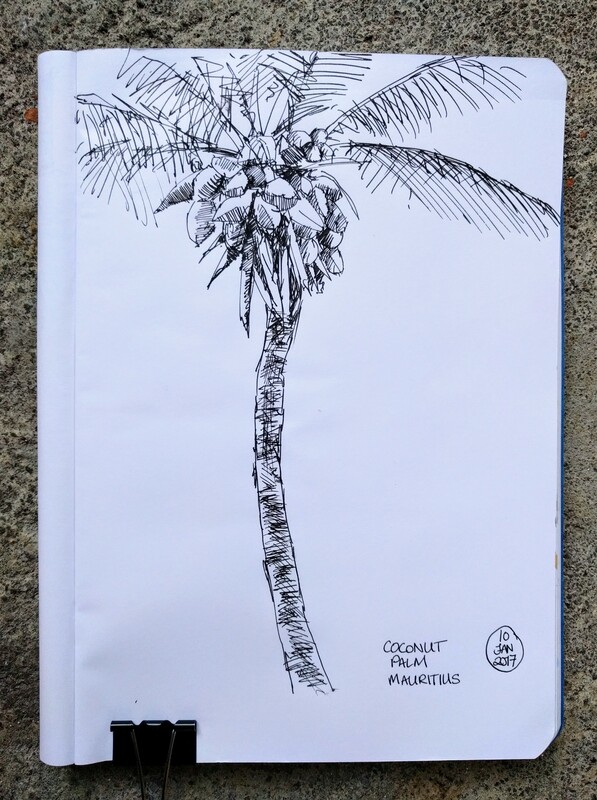 Lots of coconut palms, large fronds giving shade and shades of lush green. 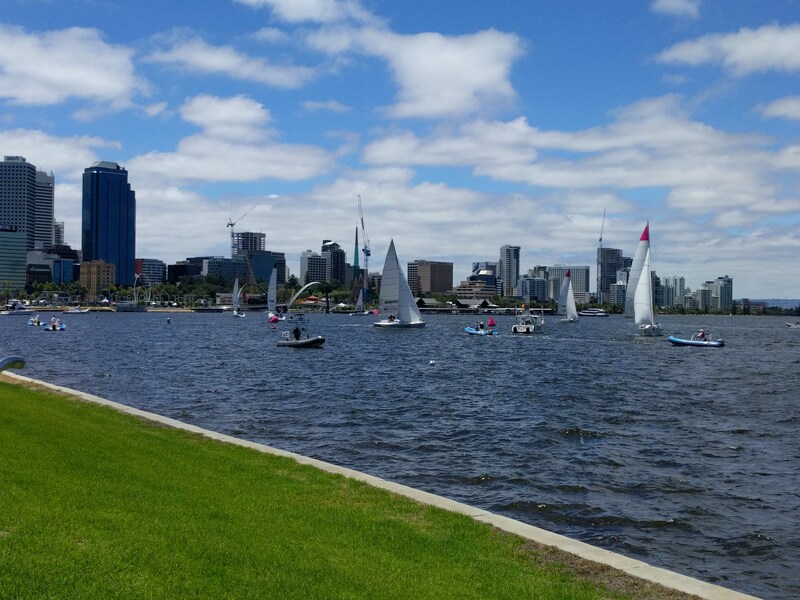 Brightly coloured birds sing and flit between the trees…. sketched just before sunset. To the Pilbara and back again…. 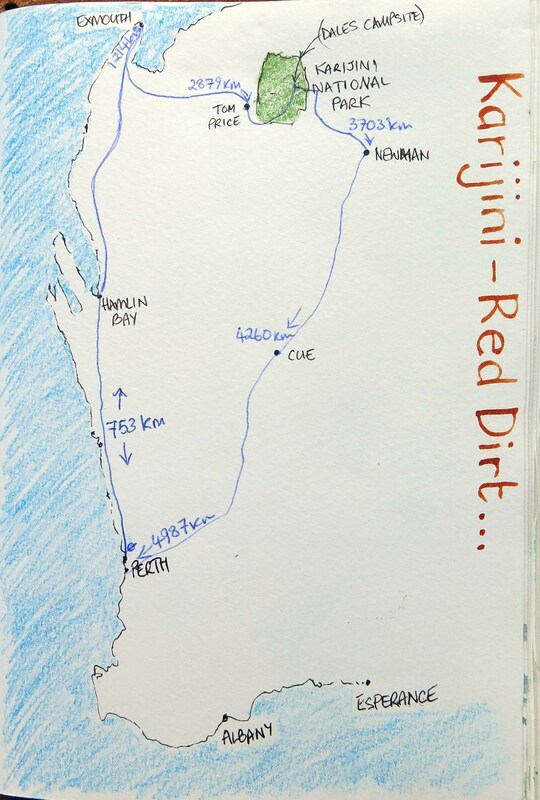 This is a little “mud” – map of our travels around part of Western Australia. The red lettering on the right side really is written with mud – red dirt – from a puddle on our campsite – genuine Pilbara red ochre! 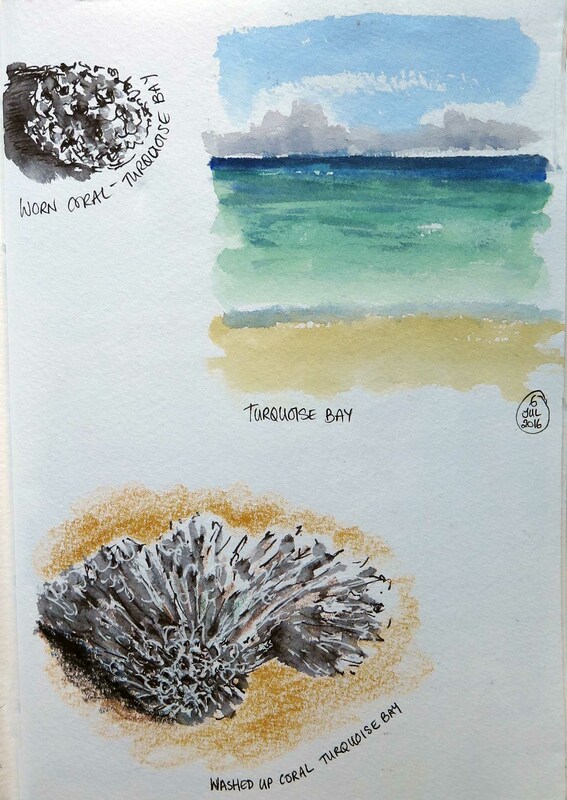 The below sketches are from various bays in the Ningaloo Marine Park – Turquoise Bay and Oyster Stacks which we snorkeled in, saw lots of fish (fishing is banned throughout most of the park), turtles, clams….lots of coral and shells. Have you ever seen a starfish this blue? 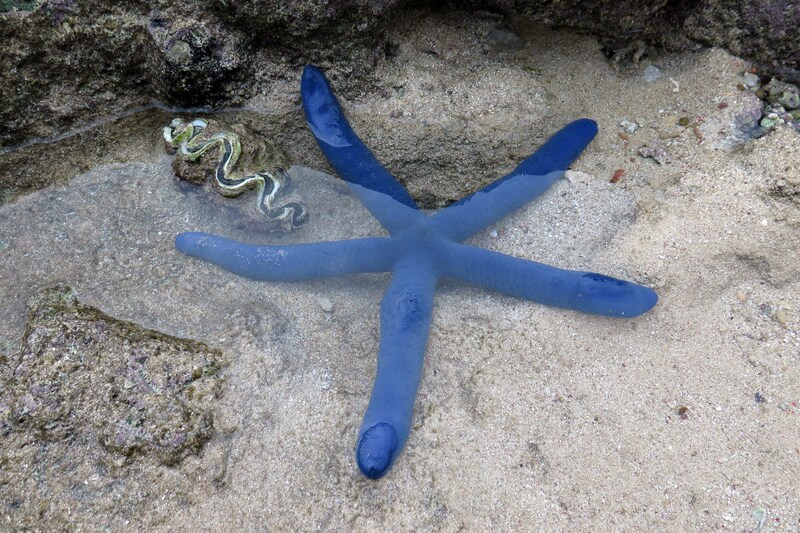 I had to include the photo to prove its amazing cobalt blue colour……we all thought it was a toy plastic starfish at first….but no it was real and alive and we saw several more when out snorkelling! 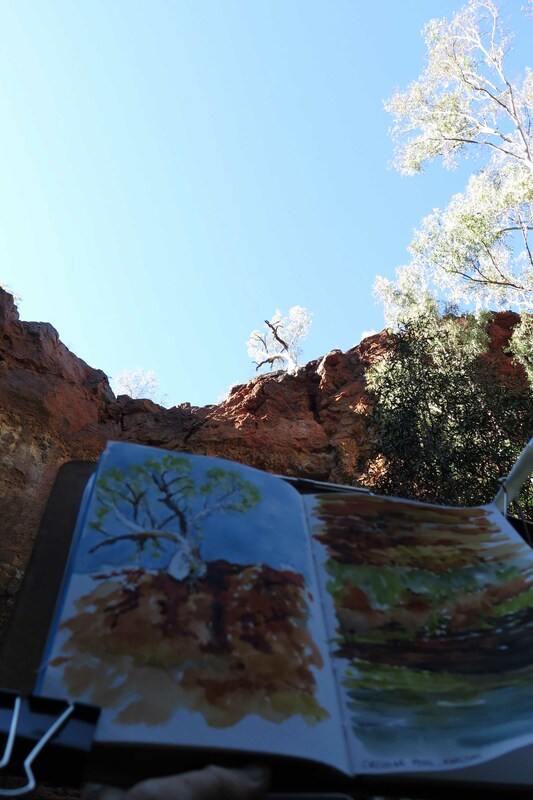 The below pictures are looking up to the top of Circular Pool in Karijini gorge, there is a white gum tree clinging on to the very top edge of the red rocks. This painting is an example of why sketching on location produces a much better record of a place than a photo….the contrast of light was too great for my camera (Canon G16) to handle (and I suspect most cameras) even after adjusting the aperture, neutral density filter, ISO, Speed etc. Most of my photos are very under or over exposed because of the extreme contrasts. 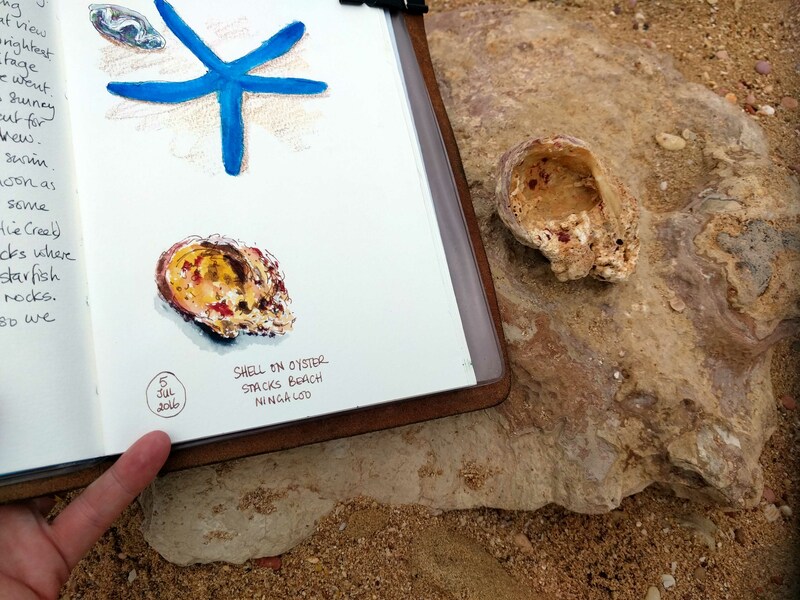 But sketching on site you can observe the real colours and your eyes compensate for the bright sunny sky and the dark shadows from the tall cliffs….sketching from a photo just wouldn’t be the same. Perth City Farm this morning. This is a community garden next to the main Midland to Perth train line (formerly scrap metal yard and battery recycling plant). The farm was started in 1994 so it’s quite well established now. 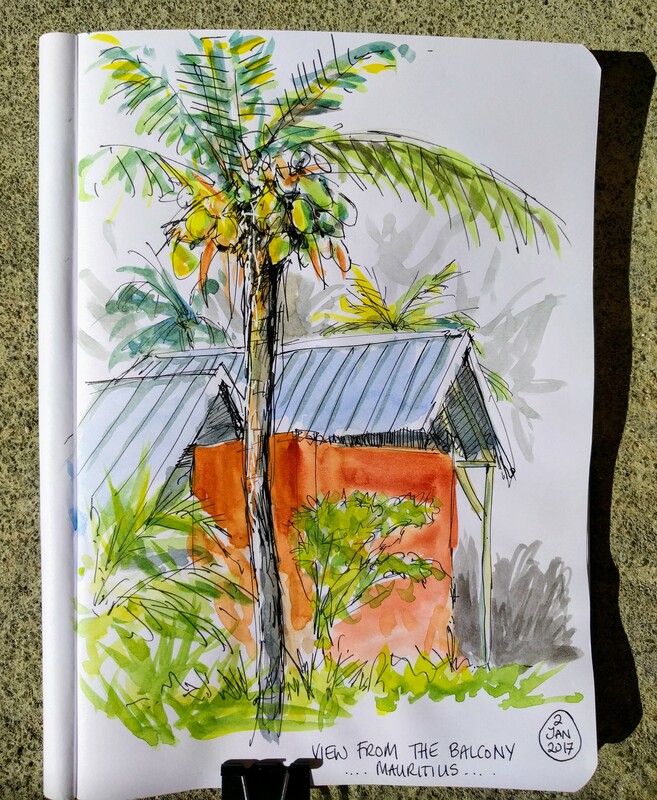 A smallish garden area was packed with very green and well watered plants (there were bananas and passion fruit growing next to my sketching spot). Organic and Biodynamic fruit, veg, dairy, eggs (free range chickens on site) and honey is sold here every Saturday morning together with other health foods, clothing and body care products. There is a lovely cafe here too. 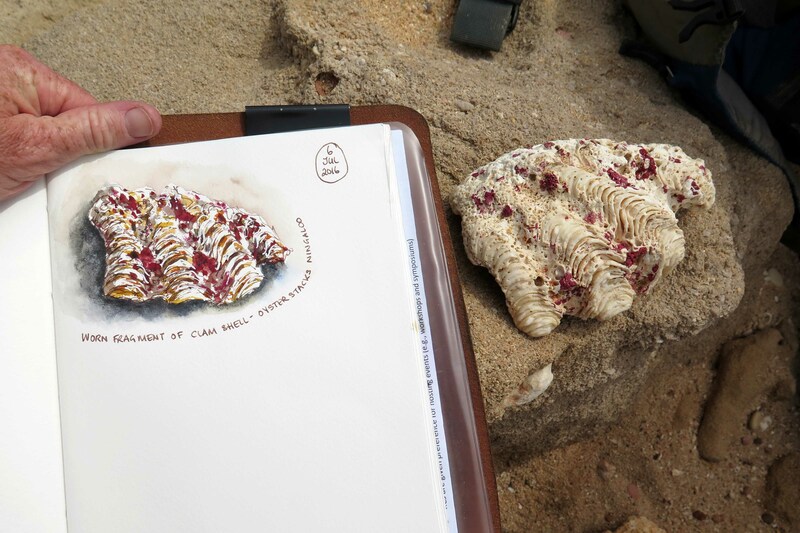 Two versions of the same sketch drawn on location but photo edited after. 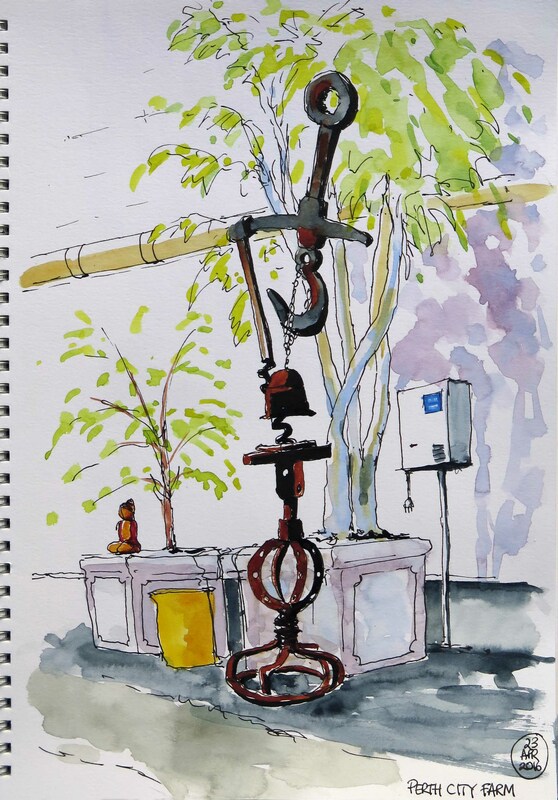 The weird and wonderful object in the sketch is a bell made from all sorts of pieces of metal welded together, somewhat rusty in places. 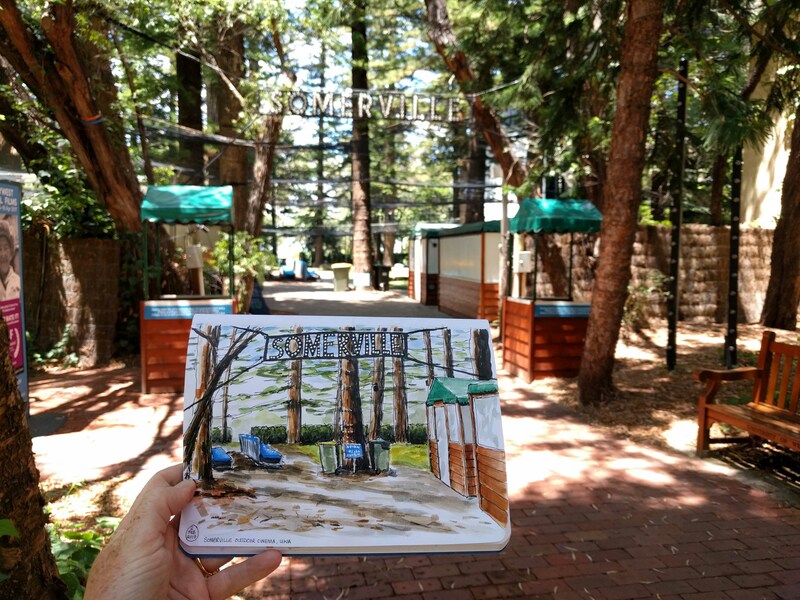 The right hand picture is the original as I coloured it with watercolour paints, but the moment that I put the green paint on for the trees…. I wished I had stopped and kept it much simpler. So I’ve made some changes in Photoshop (Elements 8) to remove the green and push it to a more neutral grey background. 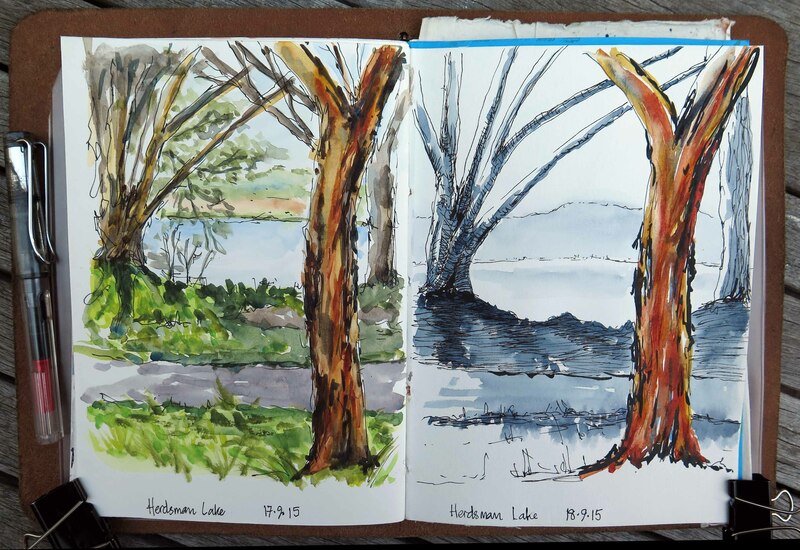 Two sketches of the same scene…. the first more colourful done on location at Herdsman Lake next to the wildlife centre. 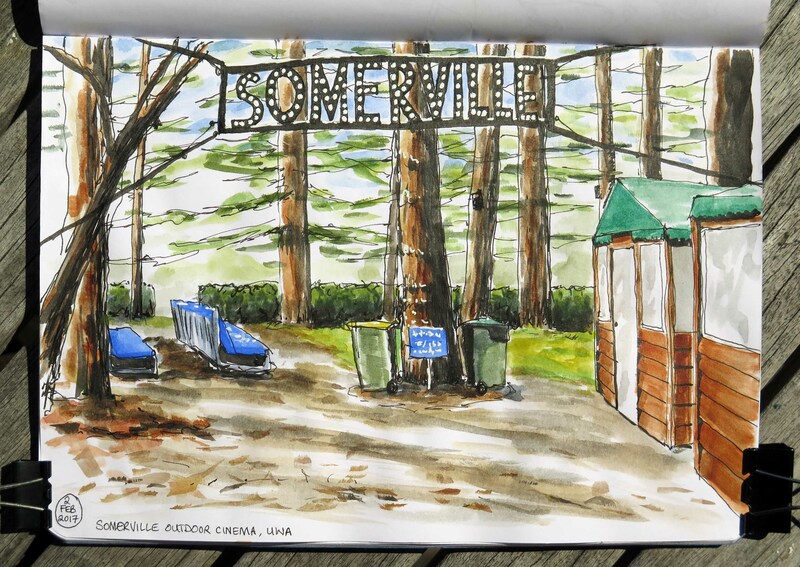 It was sketched from inside the car as I’d forgotten my sun hat. 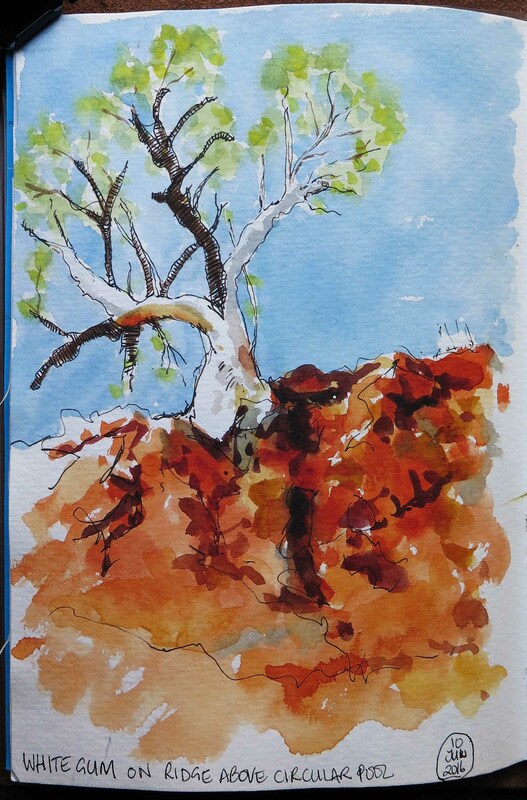 The foreground tree (paperbark gum complete with peeling bark) was the main attraction, everything else an afterthought….but I felt the tree was overworked. 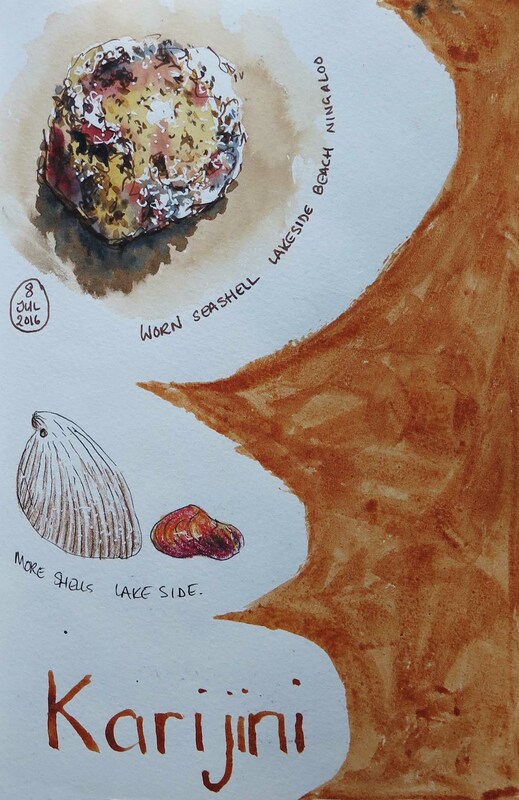 So I had another go next day working from memory and the earlier sketch (helps that it’s on the same page). 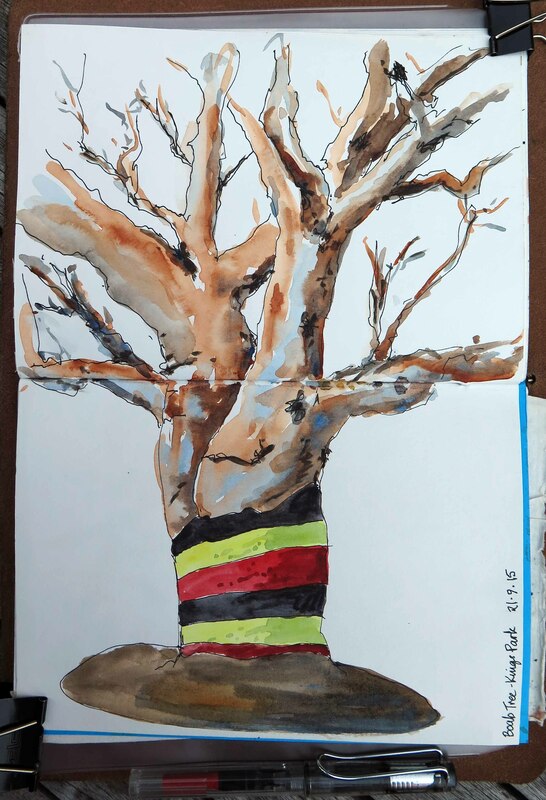 This time the tree is much fresher and I decided not to give any colour to the background (paynes grey)….it half works but the background tree was perhaps drawn with too much detail so now distracts away from the colour tree. Ah well…..another lesson learnt.